I hope everyone has had a great week so far. Lucky me is off to Sydney for a couple of days. I cant wait. I love Sydney! While I am gone I have a small and easy pattern for you all to try. It’s a little cushion or pillow to put on your bed or to give to someone special. I have mine sitting on my wing-back chair in my bedroom and its very pretty. It only takes about two hours to knit up and sew. Maybe quicker, but I’m not a fast knitter. I used my curly whirley hand spun as I’m still experimenting with it and I love the effect it has on this project, but you could use any Tracey lee hunky/ thick n thin spun or if you must, commercial spun. If you decide you want the Curly Whirley hand spun send me an email as I’m creating some at the moment. For your insert, measure 18 cm by 18 cm using a scrap piece of material that will either complement your cushion or blend into the background as you will see a bit of colour. Sew all the way around leaving an opening to fill with toy poly filling. Nice and plump and sew up hole. Sew up your knitting along the edges leaving the top completely open and put in your cushion insert. Pick your front of the cushion. Cut four ribbons approximately 30cm long and randomly thread through the front of your knitting, spacing approximately 4cm. I used pinching scissors to give an unraveled effect. I used left over ribbon to tie off on, but you can use beads or buttons. Just make sure it is well knotted and secure. I used ribbon and tied both sides together in sections of 3, but you could use buttons and push through the other side for a different effect. 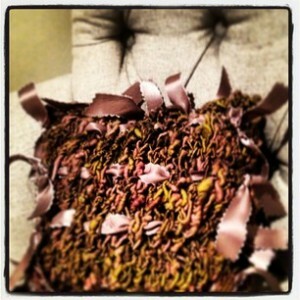 Finishing off the cushion is really up to you and how you would like to embellish your beautiful cushion. Well I hope these instructions aren’t too hard to follow as pattern writing is not my forte. Please enjoy and I look forward to seeing some beautiful creations. Have a great weekend my creative lovelies and I will chat again when I am back from Sydney. This looks awesome Tracey I can’t wait to give this go!